We all know that the best anecdote for feeling glum is to do something nice for someone else, right? Focusing our minds and efforts on thinking of another not only makes the recipient feel watched over, but it helps us forget our own problems too (or what we perceive to be problems). I firmly believe that making a paradigm shift towards constantly thinking of others will help us all be happier people. Karma...totally believe in it, do you? 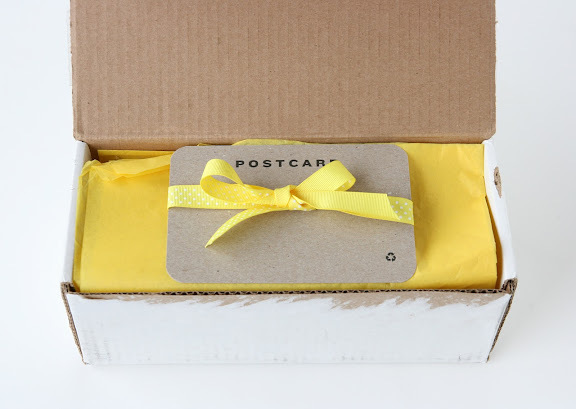 Your package doesn't have to be expensive to put together--a few things from around the house mixed with some store-bought gems are just the ticket. Have fun and be creative by coming up with a theme...like "sweet and salty", "red and white", "favorites" or "sunshine yellow" (like the one above that the lovely Miss Rebecca put together). Surely you have a few bits and baubles you'd like to share; and a box should be easy to find around the house, yes? If you're having trouble feeling inspired as to what to place inside your surprise package, jump on Etsy and start searching by color. I typed in one of my favorite colors (periwinkle), and it turns out there are over 9,000 items on Etsy listed under that color if you can believe it! Oh, and if you don't have tissue paper on hand, don't fret--try using parchment or wrapping paper instead. p.s. a fun twist would be kamikaze surprise packages...assembling and mailing several out on the same day. Just think of all the good cheer you'd spread! I love this idea, so thoughtful AND colourful! I once sent silly Valentine’s Day socks to several girlfriends and they all loved it. It wasn’t the $1 Target socks they liked as much as getting a mysterious package in the mail. We communicate so much through e-mail and social networks sites these days that an unexpected treat in the mail can really make someone’s day. I think this is the most fabulous idea I've heard in a long time. Stephanie, what a great reminder to stop and think of others. We can get so mired down in our own stuff- and that in and of itself can be isolating and only make things worse. We really do feed off each other. I LOVE this idea. I've been feeling a little glum. This should do the trick! I love this idea as well. This year I sent several. I sent jewelry I wasn't using anymore for a sibling's children for thier dress up box. In another I sent a Happy Summer box for when the kids got out of school. I included glow sticks, a camp song compliation CD, Huge campfire marshmallows, and handmade nature scavenger hunt lists. For a friend who was having a difficult pregnancy I sent a meditation CD, and handmade heatable neck pillow, a candle, and a humerous book about having children. For someone who is not well, and you are far away you can send a box full of tissue paper flowers with a get well note. Thanks Will! I always appreciate your two cents. Angela, so true...these days it's such a treat to receive "real" mail! Erin, wise words you spoke...very insightful and true!! Cecilia, you're welcome, but it sounds like you're one step ahead of me! Alli, hang in there...I think I know what you're thinking about (that might be bringing you down...sigh). Anon, your ideas are wonderful! Thanks for taking the time to share. Very inspiring. My mom and I do this to each other all the time, which is even more fun now that I am living abroad. I actually received two packages this week, one from a new friend and the other from my mom, both stuffed to the hilt with surprises and love. It makes any day so much better! I'm looking forward to shipping a few more boxes their way. What a lovely idea! It cheered me up just reading about it and looking at the photos. I love this idea! I'm having a bad day and I think by doing this, it will cheer me up a bit! Thanks for posting. engquist, you and your mom are so cute. What a great relationship you must have! I hope to exchange packages with my daughter someday when she's out of the house. Such a great idea. Thanks for sharing! Shannon, a little yellow will do that to anyone, yes? Such a cheerful color. Nikita, I hope your day turned around! 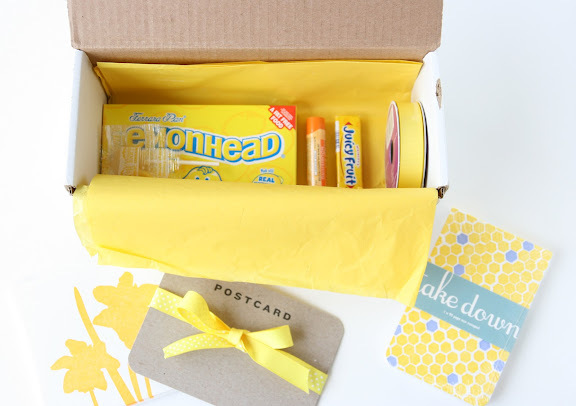 I love the yellow and who's day wouldn't be brighter with lemon heads!